“Self-love is a good thing but self-awareness is more important. You need to once in a while go ‘Uh, I’m kind of an a**hole.’” ― Louis C.K. Have you ever known someone who seemed to have no clue about their behavioral or communication patterns? Maybe they had an addiction they weren’t acknowledging, maybe their language was passive aggressive, stormy or overly critical. How did you respond? I’ve been practicing yoga for about 20 years now and am noticing more and more these little bits of self-awareness creeping in. Of course, part of that awareness is due to getting older, but when you’re on the mat, you pay attention to, for example, the weight of your big toe mound, how it differs from the pressure you’re putting on your other one. You notice whether your chin is level to the floor or if the way you’re arching your low back is causing you pain. You also begin to notice your emotional responses to a challenging pose or to a class you did or didn’t like. All of these practices are designed to keep you present, to bring self-awareness, to help you grow physically, mentally and spiritually. After all, how can you move forward if you don’t know your starting point? Self-awareness means we know we’re not perfect. That we don’t always make the best choices. But, equally important, it also means we know we’re pretty darn cool. I see it in spades in all the people I have the privilege of teaching every day. 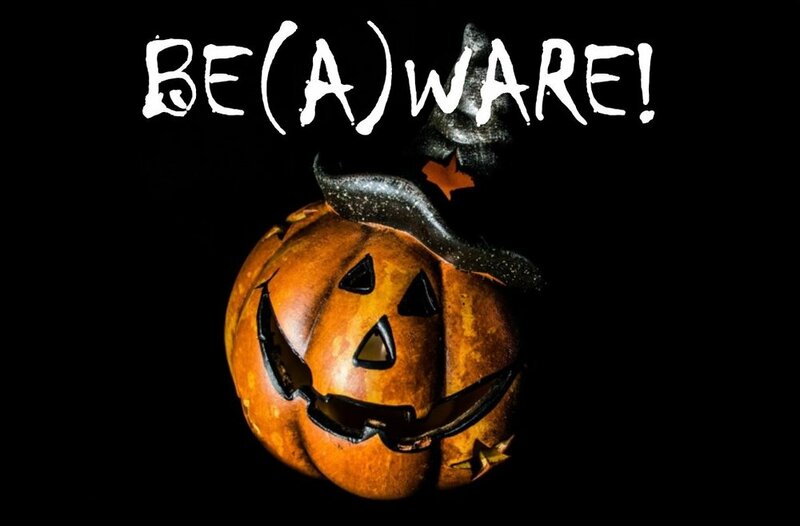 In this spooky month, I invite you to be(A)ware! Look your goblins right in the eye. I promise you it’s less scary than you think.